Chakor Makarand Rokde Civil Hospital, Wardha, Maharashtra, India. N V Dravid Annasaheb Chudaman Patil Memorial Medical College, Dhule, Maharashtra, India. Background: Vesiculobullous disorders are a complex group of disorders which continue to be an enigma. Wide variety of pathological processes can lead to development of Vesiculobullous eruptions over the body. They may occur in many dermatoses which include various inflammatory, infective, autoimmune, drug induced as well as genetic conditions. Each entity of vesiculobullous lesion has similar or confusing clinical features but different histopathological morphology. Histopathological examination is helpful in definitive diagnosis of vesiculobullous disorder which is very essential for specific treatment and an appropriate desirable outcome. Aim:To study and classify various vesiculobullous lesions of the skin in various categories. 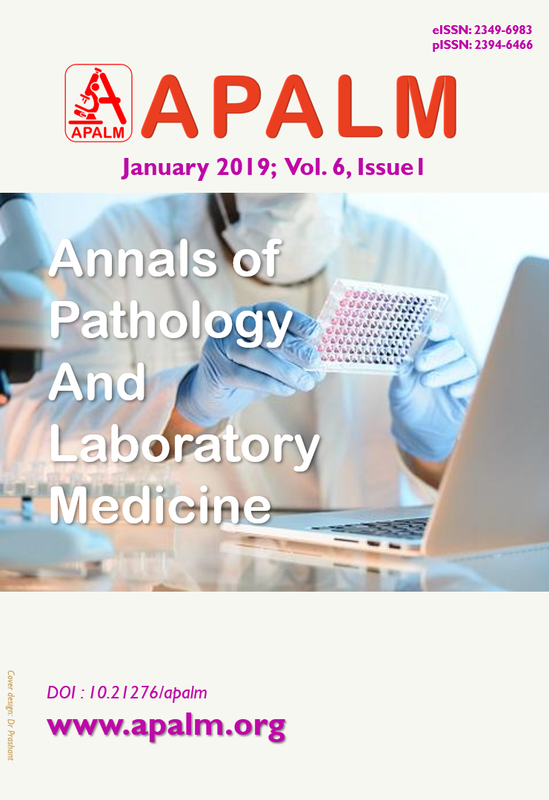 Material and Method:A prospective observational study of vesiculobullous lesions of the skin biopsies of 93 cases were received to the department of pathology over a period of 3 years. Complete clinical and relevant history was recorded. The specimens were routinely processed and haematoxylin and eosin stained slides were studied. Result: A total of 93 cases of vesiculobullous lesions of the skin were diagnosed. Among these lesions, Pemphigus vulgaris were seen in 34 (36.55%) cases, Bullous pemphigoid in 22(22.65%) cases of and spongiotic dermatosis in 14 (15.05%) cases. The maximum numbers of cases (32.25%) were in 4th to 5th decades. Conclusion: Thorough histopathological workup and clinical correlation is essential to confirm diagnosis of vesiculobullous lesions of skin. Chakor Makarand Rokde, Civil Hospital, Wardha, Maharashtra, India. N V Dravid, Annasaheb Chudaman Patil Memorial Medical College, Dhule, Maharashtra, India. 1. Hong WU, Brian S, Terence JH. Non- infectious vesiculobullous and vesciculopustular diseases. 9th ed. In: Levers Histopathology of the Skin, DavidE, George FM, Rosaliets, Bernett LJ Jr, eds. India: Lippincott Williams and Wilkins; 2005: 243-245. 2. Tani M, Shimi R. SLE with vesiculobullous lesion: immunoelecton microscopic study. Arch Dermatol 1984 ; vol 120(11): 149-501. 3. Gane N.F.C. A guide to bullous lesion of the skin. Journal of clinical pathology 1973 ; vol 26 (3): 235-237. 4. Alexander J.F. Lazar, Murphy G.F. The skin. 8th ed. In: Robbins and Cotran Pathologic Basis of Disease. Kumar V, Abbas AK, Fausto N, Aster JC : Saunders; 2010: 1165-1204. 5. Deepti S.P. Sulakshana M.S. et al . A histomorphological study of bullous lesions of skin with special reference to immunofluorescence. International Journal of Current Research and Academic Review 2015 ; vol 3(3) : 29-51. 6. Arundhati S, Ragunatha S, Mahadeva K.C. A cross sectional study of clinical, histopathological and direct immunofluorescence spectrum of vesiculobullous disorders. Journal of clinical and diagnostic research 2013 ; vol 7(12) : 2788-2792. 7. Nanda A, Dvorak R, Khloud AS, Humocid AS, Alsaleh QA. Spectrum of autoimmune bullous diseases in Kuwait. Int J Dermatol 2004;43:876-81. 8. Nurul Kabir AKM, Kamal M, Choudhary A M. Clinicopathological correlation of blistering diseases of skin, Bangladesh. Med Res Counc Bull 2008; 34(2):48-53. 9. Murthy T. K, Shivarudrappa A.S, Biligi D. S. Histopathological study of vesiculobullous lesions of skin. International journal of biological and medical research. 2015; vol 6(2):4966-4972. 10. Soner U, Murat D, Ayse A, Suhan G, Canan U, Hamdi R.M and Erkan A.M.P in the Mediterranean region of Turkey: A study of 148 cases. International Journal of Dermatology 2006; 45 (5): 523–528. 11. Patel PR, Patel PB, Chiplonkar SG. Histopathological study of vesiculobullous lesions of the skin: A study at tertiary care hospital. International journal of medical science and public health. 2014; vol 3(6): 738-740. 12. Deval V, Vijay P, Viral B, Dimple AM, Bharat B, Meet K. A Study of 75 Cases of Pemphigus in Saurashtra Region of India. Iranian Journal of Dermatology. 2010; 13(2):42-46. 13. Arya SR, Valand AG, Krishna K. A Clinico- pathological study of 70 cases of Pemphigus. Indian J Dermatol Venereol Leprol. 1999; 65(4): 168-171. 14. Langan SM, Smeeth L, Hubbard R, Fleming KM, Smith CJP, West J. Bullouspemphigoid and pemphigus vulgaris—incidence and mortality in the UK: Population based cohort study. BMJ. 2008 Jul 9; 337:a180. 15. Budimir J, Liborija L M, Situm M, Bulat V, Persic S, Tomljanovic-Veselski M. Oral lesions in patient with pemphigus vulgaris and Bullous pemphigoid. Acta Clin Croat 2008; 47:13-18. 16. Leena JB, Chandrashekar M, Vijaya B, Sunila R, Manjunath GV. A Clinicopathological study of immunobullous lesions of the skin a 2 years study. Adv Lab Med Int. 2012; 2(2): 49- 60. 17. Nishioka K, Hashimoto K, Katayama I, Sarashi C, Kubo T, Sano S. Eosinophilic spongiosis in bullous pemphigoid. Arch Dermatol. 1984; 120(9): 1166-1168. 18. Abreu VAM, Loebel AM, Howard M S. Spongiotic dermatitis with a mixed inflammatory infiltrate of lymphocytes, antigen presenting cells, immunoglobulins and complement. N Dermatol online. 2011; 2(2): 52-57. 19. Banu l, Gulen GN, Selen S, Hulya E. Evaluation of Clinical and Histopathologic Direct Immunofluorescence Diagnosis in Autoimmune Vesiculobullous Dermatitis: Utility of Direct Immunofluorescence. Turkish J of Pathology. 2012;28(1):011-016. Authors retain copyright and grant the journal right of first publication with the work simultaneously licensed under a Creative Commons Attribution License that allows others to share the work with an acknowledgement of the work's authorship and initial publication in this journal. Authors are permitted and encouraged to post their work online (e.g., in institutional repositories or on their website) prior to and during the submission process, as it can lead to productive exchanges, as well as earlier and greater citation of published work (See The Effect of Open Access at http://opcit.eprints.org/oacitation-biblio.html).